Team building for Metro New York and Northern NJ corporate events. Experience the fun and energy of working together to create something delicious! Our culinary team building events bring business people together to improve communication, interaction and cooperation, to build morale and incite random bursts of laughter. The act of preparing good food together becomes the focus for sharing responsibility and appreciating each individual’s contribution. Your group will prepare a customized sit down meal or cocktail party with ALL hands in the pot. What better way is there to work towards a common goal than roasting, grilling, sautéing, braising and baking an incredible dessert? Incorporate some competition in your cooking event with a timed “FIRECRACKER CHALLENGE.” This lively and competitive team building event is the hottest concept in the kitchen today. 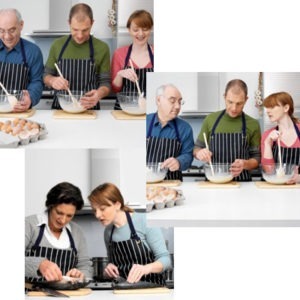 Your group will be divided into teams and compete in a timed cooking competition. You will think on you feet and create new fabulous favorites. Guests enjoy their meal while a judge rates the dish(es) to determine a winner. Go on, TASTE this experience!! Each COOK EASE event is custom designed to meet your corporate or organization goals and accommodate your budget. We welcome groups of ten to twenty-five, any day and any time.